Disclaimer: I was given products in this post for the purpose promoting. I was not paid to write this review. 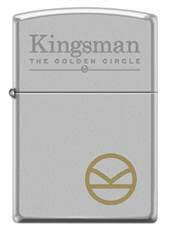 When Kingsman: The Golden Circle arrives in theaters on September 22, 2017; look for the iconic Zippo lighter in the hands of at least one dashing agent. Zippo Manufacturing Company is proud to partner with MARV films and 20th Century Fox to create an exclusive Kingsman: The Golden Circle Zippo windproof lighter. Only available to winners of Zippo and Fox/Kingsman sweepstakes, this Satin Chrome lighter features auto two-tone engraving, with the Kingsman: The Golden Circle logo on the lid, and Kingsman medal motif – the sophisticated hallmark of the international intelligence agency, solidly engraved deeper into the lighter to allow the warm brass to shine through. For the fan wanting a replica of the lighter featured in Kingsman: The Golden Circle, look no further than theclassic brushed chrome Zippo lighter, a cinema stalwart spanning eight decades of film and television appearances. Kingsman: The Golden Circle stars original cast members Taron Egerton, Colin, Firth, and Mark Strong, and introduces new cast members Halle Berry, Jeff Bridges, Julianne Moore, Pedro Pascal, and Channing Tatum. See it only in theaters beginning September 22. One of the most recognized brands in the world, Zippo was founded in the fall of 1932 by George G. Blaisdell in Bradford, Pennsylvania, where it has manufactured over 550 million windproof lighters. With the exception of improvements to the flint wheel and modifications in case finishes, the product remains unchanged and is backed by the company’s famous lifetime guarantee – "It works, or we fix it free.™" Zippo’s diverse product line includes lighters and accessories; butane candle lighters; fragrance, and a robust line of heat and flame products for outdoor enthusiasts. Zippo markets in over 180 countries, and owns Bradford-based W.R. Case and Sons Cutlery Company and the Ronson family of brands. For more information, visit zippo.com.